National handball winners: Abbeyknockmoy's Emma Kinane and Niamh Heffernan of Claregalway. 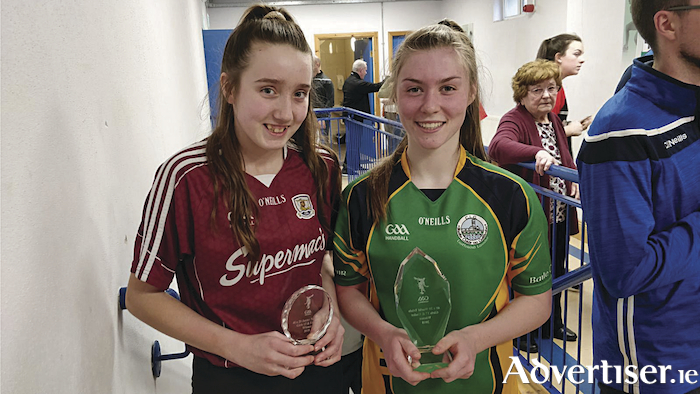 Galway girls produced top finishes at junior national handball championships in Kingscourt at the weekend. Claregalway's Niamh Heffernan and Abbeyknockmoy's Emma Kinane claimed respective national titles at U17 and U13 levels at the 40x20 Irish World Trials/Junior Nationals. Heffernan has now booked her place on the Irish team for the Worlds in Minnesota in August after battling hard for her crown. Although she eased to victory in the opening match 15-1,15-1, it took three games against Kildare's Mollie Dagg, 15-13, 13-15, 11-0. On the other side of the draw Irish No 1 seed Leah Doyle, also from Kildare, breezed past her opponents (15-2, 15-4 ), and (15-0, 15-0 ), to set up a final with Heffernan. The Claregalway youngster, however, took on the favourite to win the final in two straight games, 15-12, 15-10, to earn a place on Team Ireland. Abbeyknockmoy's Emma Kinane was crowned U13 champion after a tense, hard fought final against Wexford's Jodie Keeling. No stranger to winning titles, having success in county and provincial championships at U11, U12, U13 and U14, she was narrowly beaten in the All-Ireland semi-final earlier this year. However at the weekend she found her form to dispose of Keeling 15-5, 15-10. At U15 level Sadhbh Ní Fhlaithearta from Mhicheal Breathnach's won the Plate competition after seeing off fellow club member Skylan Ni Mhaille.